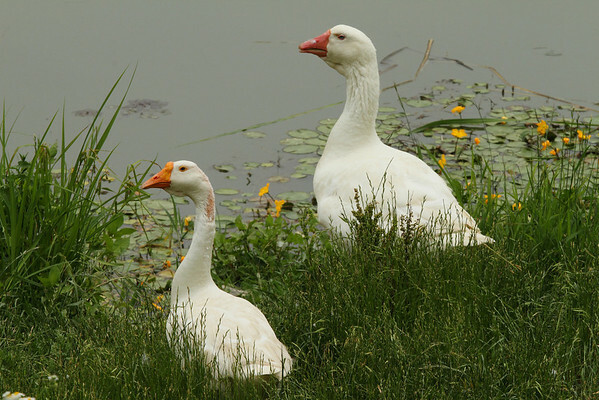 Generally birders are easy-going, energetic, active, and hyper-aware of their surroundings. You could also use the words obsessive, quirky, eccentric, or just downright weird. I think you have to be all of these things to do what I do. Well, I wouldn’t describe myself as weird, but all the others certainly apply. Therefore it may seem strange to use a word like nemesis to describe a bird, of all things. Isn’t that a little harsh? Well, yes and no. A nemesis bird is birder lingo for a bird that one has repeatedly tried to see and repeatedly been denied the pleasure (what we call “being dipped”). We all get dipped from time to time. What makes a bird a nemesis is the continuous, often times incessant, refusal to be where it is supposed to be, so that we don’t drive for hours on end, halfway across a state or province, just to find out that we “just missed it.” That phrase (or related ones like “it was just here” or “I just saw it five minutes ago”) are like the Achilles’ heel of a birder’s composure; we typically lose our cool at that point, and a stream of swearing and profanity can often ensue. The more swearing and profanity, the more nemesis a nemesis bird is. A nemesis bird can also be one that, for reasons unknown, cannot be found in an area or habitat where it should be found. Making several trips to an obscure tract of forest or unknown marshland all for the chance to see a bird that should be there, only to find out that it isn’t, even though everyone you’ve spoken to says it’s a “sure thing,” or “you can’t miss it” gives the title of Nemesis to even the most unsuspecting of sparrows. I’ve had several nemesis birds in my time, but those were all back in North America, and all but one have been found and checked on my list (I’ll get you one day, American Three-toed Woodpecker). I didn’t think I’d be in South Korea long enough to get a nemesis bird here, but what did I know? My field guide calls it the Common Kingfisher (Alcedo atthis). Some words of advice for beginners: don’t ever fall for the misnomer of “common.” A lot of birds with the word common in their names are anything but. There are three species of kingfisher that can be found on the Korean peninsula, not including vagrants. Despite living in a city with two rivers, and visiting other rivers, reservoirs, and lakes, all across the southern portion of South Korea, I had been unable to find any of these so-called common kingfishers. Belted kingfishers (Megaceryle alcyon), the widespread kingfisher of North America, can be found almost anywhere there is water, including even drainage ditches. So it’s understandable why a bird called the “common” kingfisher quickly got on my Nemesis List for being so completely un-common. So, as happens with some nemesis birds, I try to put it out of my mind and focus on more attainable birds. But of course, I can’t walk past a suitable body of water without looking for my nemesis. Melanie had a Hiking Club outing with her school on Friday. She took the kids to Damyang, just outside of Gwangju, and they walked along the Yeongsan River bike trail. She came home and mentioned seeing a strange heron, which she described as being similar to a black-crowned night-heron, but darker. She’ll be the first to admit that her ID skills are not as honed as my own, but while she may not be able to identify a species just by its song, she definitely knows what she’s seen and what she hasn’t. So Saturday morning we took a trip to Damyang, to retrace her steps and see if we could relocate this mysterious heron. We hopped on the #311 village bus to Damyang; it’s a short trip, only about 15 minutes or so. 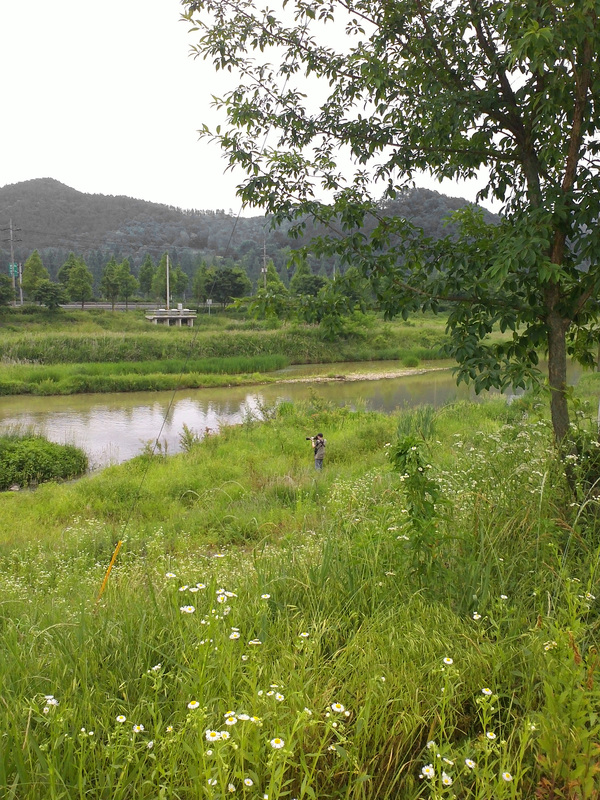 We got off right near the Yeongsan River, across the street from the Juknokwon Bamboo Forest (죽녹원). If there had been enough time we would have checked out the bamboo forest, but we were both interested in walking the riverside, so perhaps another trip. Our starting point was a small district in Damyang, with numerous restaurants, shops, an archery range, and of course the bike path along the river. There were many families enjoying the good weather, but it was by no means crowded. We began walking past a sports complex on the banks of the river, complete with a 1km running track. The bike path next to this complex was lined with shrubs, and squeezing through a gap in the vegetation, hoping to get a better look at the river, I found a Japanese tree frog in the foliage. I almost knocked it off its branch as I tried to get through the shrub. 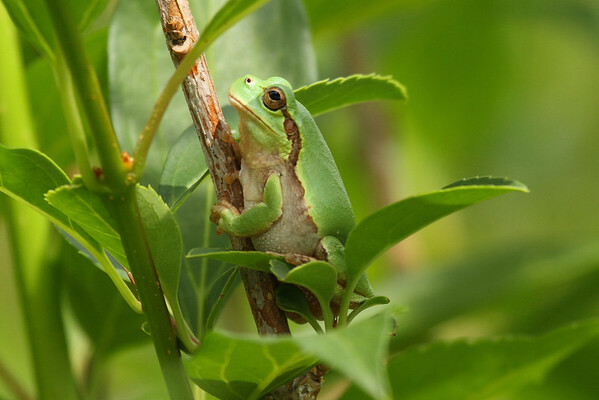 There are only two species of tree frog in South Korea, the Japanese and the Suwon tree frog. The Japanese tree frog is more widespread; the range and preferred habitat of the Suwon tree frog are poorly understood. A Japanese Tree Frog (Hyla japonica) near the Yeongsan River in Damyang. The river was a magnet for heron species, and we quickly spotted grey heron, great egret, intermediate egret, and little egret near the shore. Several domestic mallards and greylag geese were also dabbling in the water. 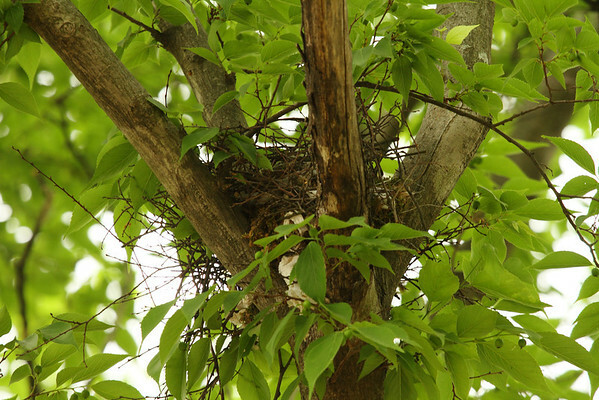 Eurasian and azure-winged magpies flew along the length of the river, and very close to our bus stop I found an azure-winged magpie nest still under construction by two adults. One of a half dozen nominate Little Egrets (Egretta garzetta garzetta) in Damyang. 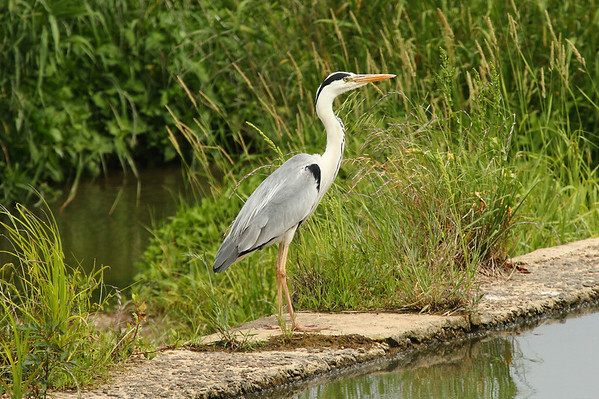 A stately looking Grey Heron (Ardea cinerea cinerea) watches over a small spillway on the Yeongsan River in Damyang. 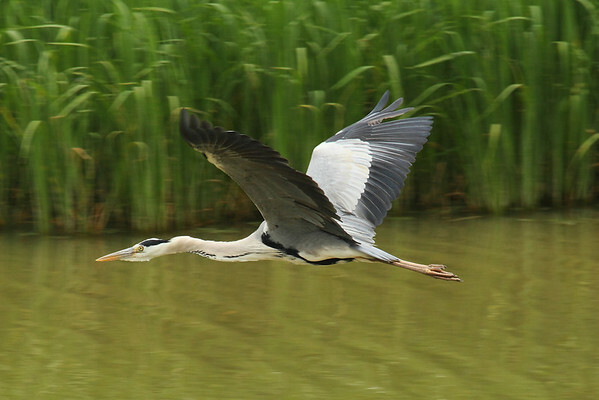 A Grey Heron takes to the air. 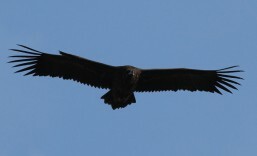 It’s amazing to watch such a large bird fly so gracefully above the water. The future home of a pair of Azure-winged Magpies (Cyanopica cyanus koreensis) near the Yeongsan River. There was a small spillway along the river where we found singles of great and intermediate egrets, a grey heron, and two eastern spot-billed ducks. As we passed the spillway, a small dark heron burst out from the vegetation and flew downstream. I was able to get it in the binoculars, and sure enough, it was a striated heron. Melanie confirmed that this was the same thing she had seen the day before on her school hike. And so, Lifer #497 was added to the list. We continued a little further before crossing a bridge and heading back on the other side of the river. Heading back to our bus stop, we found three mandarin ducks, and got some close up views of a black-crowned night-heron and a Eurasian kestrel. Near another spillway we located a second striated heron. 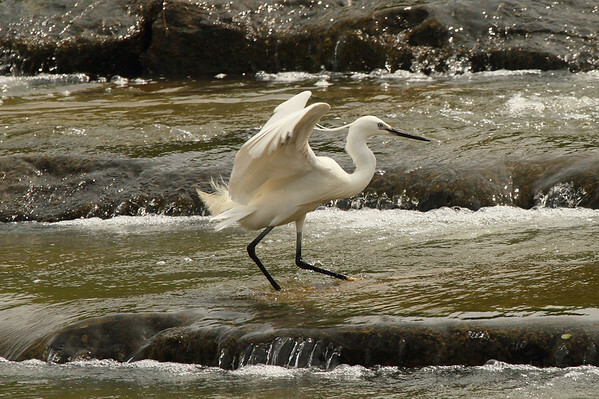 This bird would stand at the base of the spillway and pick small fish that got too close. I was able to use the vegetation and get in close to the base of the spillway, and when the heron returned to its place, I got a chance at some amazing photos. 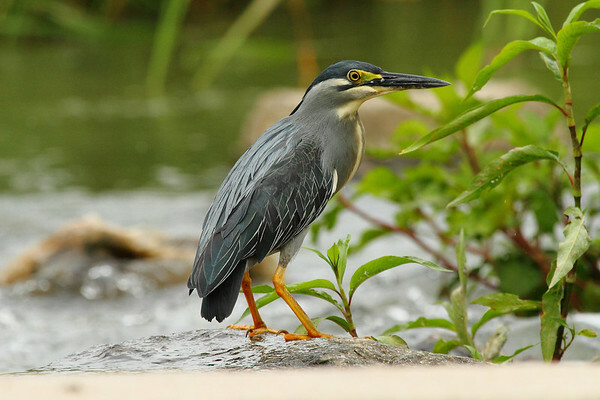 Near this portion of the Yeongsan River, we found and observed an incredibly accommodating Striated Heron. 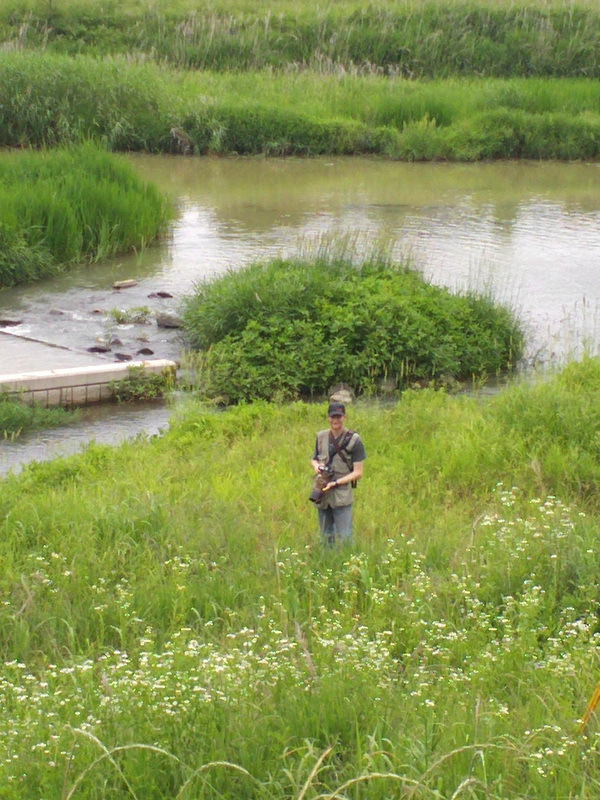 I used the tall grasses to get close to the heron’s preferred hunting spot at the base of the spillway. gives me a passing glance before returning to catching fish. My victory portrait, after successfully photographing Lifer #497. 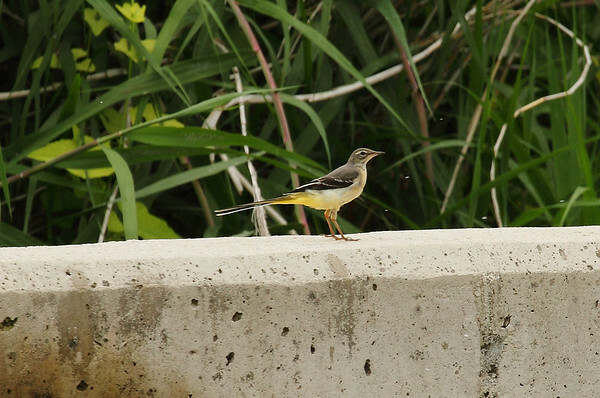 While I was photographing the heron, I noticed a female grey wagtail walking the concrete spillway. Might as well snap a few photos of her while I’m at it. 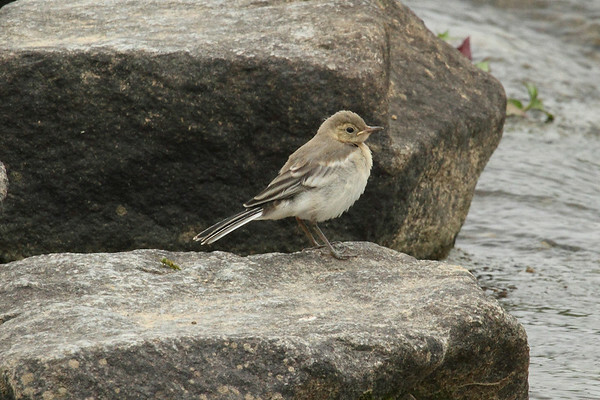 A Grey Wagtail (Motacilla cinerea robusta) at the Yeongsan River. After the spectacular photo session with the striated heron, we had some lunch before continuing our hike. While eating, I saw and heard several other species, including a cattle egret, a Japanese bush-warbler, a pygmy woodpecker, a passing black-naped oriole, and three common cuckoos. One of the cuckoos was kind enough to let me take a portrait. 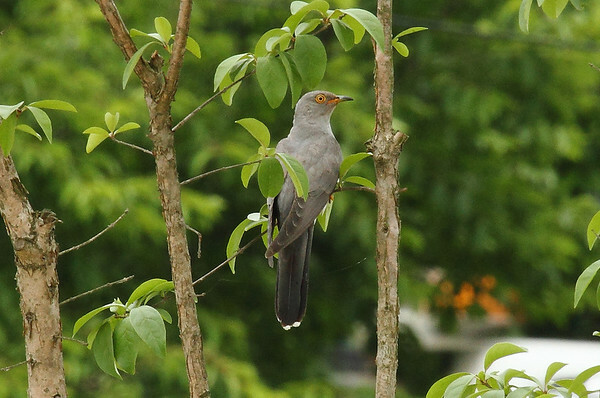 A Common Cuckoo (Cuculus canorus) near the Yeongsan River in Damyang. 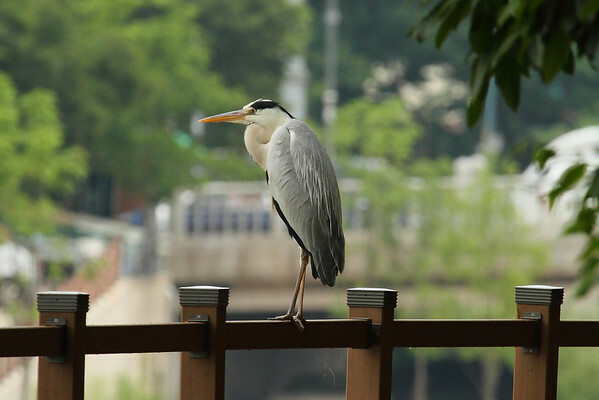 A Grey Heron sits idly on the railing of the boardwalk on the Yeongsan River in Damyang. A fledgling “black-backed” White Wagtail (Motacilla alba lugens) waiting to be fed by an adult. 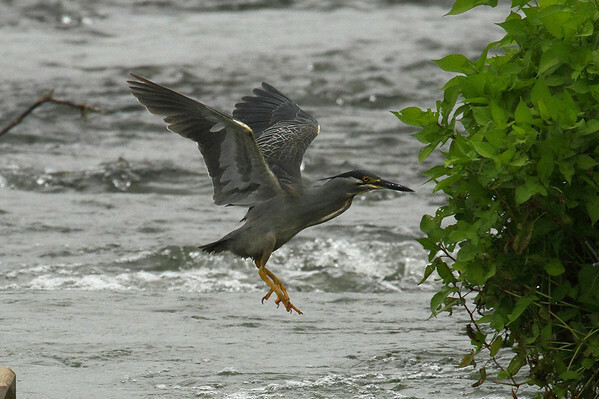 A Striated Heron jumps across a gap in the spillway at the Yeongsan River in Damyang. The herons really enjoyed hunting along spillways such as this. After a few hours of hiking, we decided to get on the bus back to Gwangju. 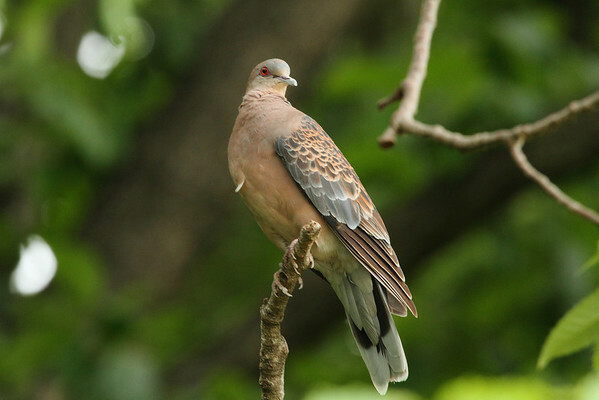 I stopped to photograph the oriental turtle-dove pictured above, when there was a high-pitched squeak and a small flash of iridescent blue. From under the boardwalk came a tiny bird, which flew over the river, stopped and hovered, dove into the water, and then flew off into the surrounding trees. The whole event lasted no more than fifteen seconds. And just like that, my nemesis was finally caught: the bird was a common kingfisher, probably a male. Suddenly I began to notice all the signs around me. The bank of the river here was high, the boardwalk cutting into a sandy cliff – perfect habitat to put a kingfisher nest. There were several dead branches hanging over the water, and underneath most of them were ample collections of droppings – obviously the kingfisher had several favorite perches to watch the river from. We waited around for awhile, and were treated to several more views of this diminutive bird. Kingfishers as a family are notoriously wary of humans, and photographing them is an exercise in patience and persistence. Alas, I didn’t manage to catch my nemesis on film, but just seeing it was memorable enough. 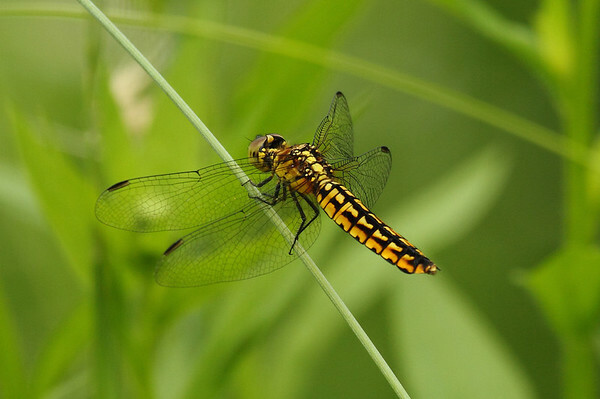 During the course of our hike, we also encountered a variety of dragonflies and butterflies. 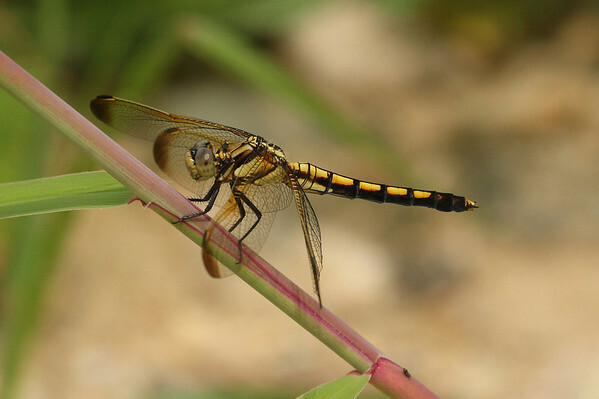 I have yet to locate a source of identifications for Korean dragonflies, so many of these will remain unknown until I can get my hands of a field guide or locate an accurate website. The butterflies, on the other hand, I am pretty confident in IDing. We found several of these unnamed damselflies during our walk. 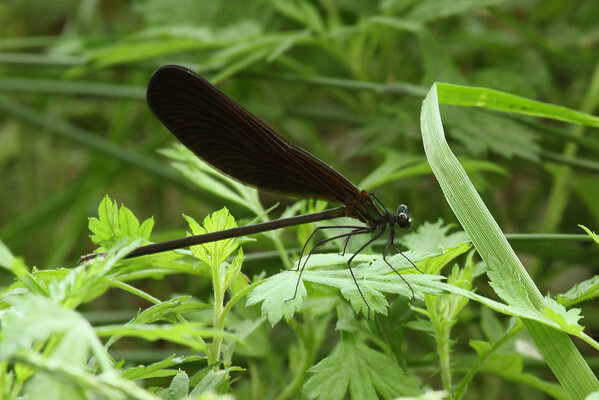 They are referred to by their Latin binomial Calopteryx atrata, and do not have a common name as of yet. 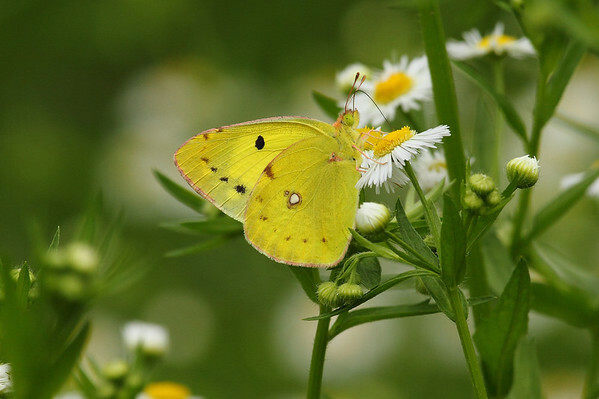 We found many of these Eastern Pale Clouded Yellows (Colias erate) along the bike path. A female Deielia phaon, an Asian dragonfly that does not have a common name. We encountered quite of few of these dragonflies during our hike. 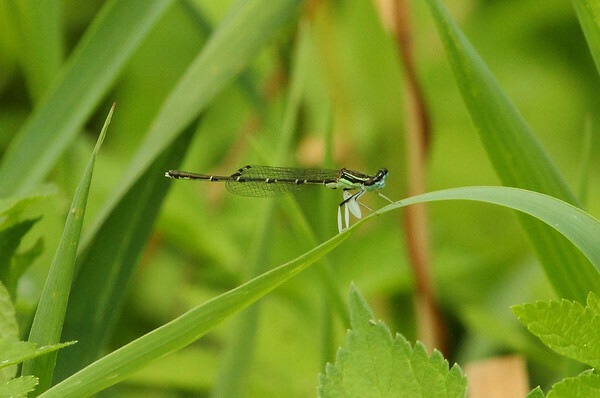 Many of these small damselflies were flitting between blades of grass. They’re identified as Platycnemis phyllopoda. 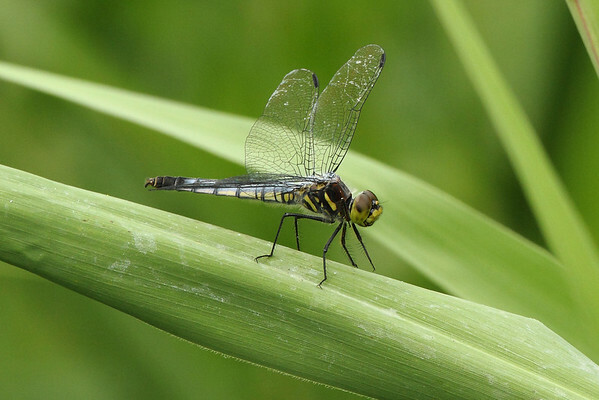 A female Black-tailed Skimmer (Orthetrum cancellatum). The males of this species are a chalk-blue color. 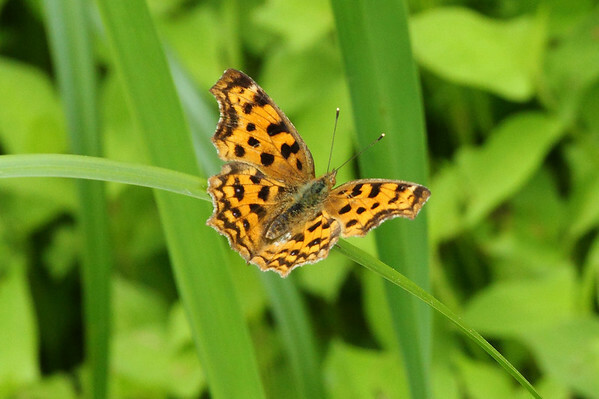 An Asian Comma (Polygonia c-aureum). I managed to photograph this active butterfly as we were returning to the bus stop. Deielia phaon, a male this time. Our hike along the Yeongsan River had proven to be quite productive, both in terms of birds and wildlife in general. Nabbing two lifers also helped sweeten the deal. And any time you can check off a nemesis bird, well, life doesn’t get much better. Now, to try to photograph said nemesis bird…ahh, another challenge for another day. This entry was posted in birding, trip report and tagged birding, damselfly, damyang, dragonfly, geumwol-ri, hyanggyo-ri, jeollanam-do, river, south korea, tree frog, trip report, wildlife, yeongsan river. Bookmark the permalink. Great story Pat, I was wondering when the punch line was going to come at first, but the story was developing so interestingly that I almost forgot the teaser intro about the nemesis bird at the beginning.